NEW - Easily convert a cello into a very nice mini-bass that has the same notes and octave as a big honker upright bass & plays/sounds great. of converting it into a bass. play & a heck of a conversation piece. & accompanying music with it held like a guitar is a joy! 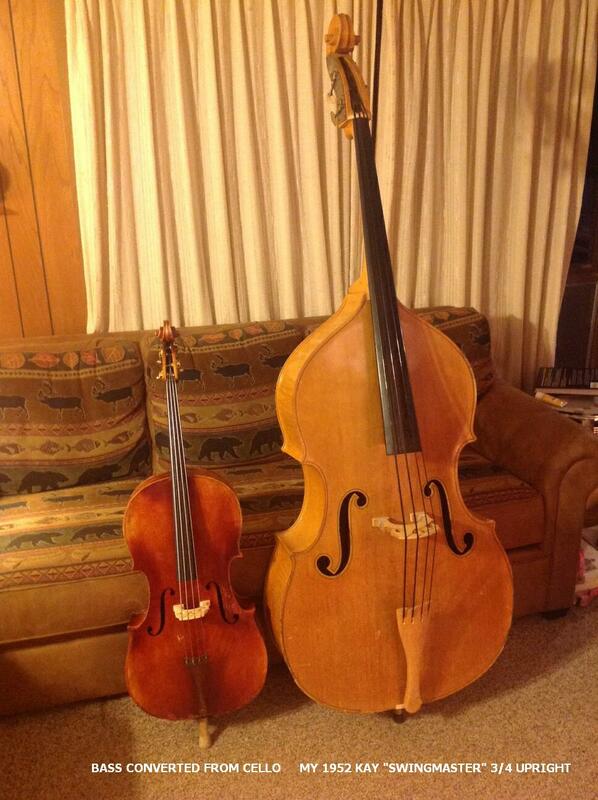 - Retune to EADG (low to high) in the same octave as a big upright bass. flat-wounds are smooth as silk and virtually silent when sliding. in gauges up to .130 inch with poor results. USE THE FENDER FLAT-WOUNDS! which easily handle the reduced tension of the shortened Fender strings. wooden friction pegs & is handled in the same manner. groove with a #2 pencil for lubrication. still being a lot shorter than on an electric bass. Please let me know if you make this conversion.